large groups, and I am ecstatic! 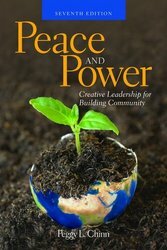 Of course I would be surprised if anyone involved has actually seen “Peace and Power,” but the important thing is that the ideas that many of us in my circle of friends and colleagues have been using for years are in fact part of a much larger ideal and vision! For folks who are not (yet) familiar with my long-running book “Peace and Power,” you can peek inside on Amazon! The cover here (and on Amazon) is the 7th edition, but the 8th edition will be out in January! The video below caught my eye today – it explains the main features of the processes they are using. The “Peace and Power” ideal that is particularly important to notice is that of shared and rotating leadership, and how they are working with shared responsibility and integrating anyone who steps up into the “leadership” process. This is an ideal that baffles most folks in the traditional hierarchies in which I have worked throughout my career, and is met with utter skepticism! But in my heart, I know it works, and brings about all the satisfactions, as well as the frustrations, that the “occupy” folks talk about in this video. Like them, I can heartily say that the satisfactions far outweigh the frustrations! I believe that this movement is immensely important and significant, not only because of the purposes and ideals that it seeks in terms of social and economic changes, but as a major demonstration of the kinds of social processes that I believe we desperately need for the future. In fact, the new 8th Edition Title is “Peace & Power: New Directions for Building Community.” As many of you know, the title of the first edition (1984, authored by Charlene Eldridge Wheeler and me, and self-published) was “Peace & Power: A Handbook of Feminist Process.” After lots of angst, we agreed to abandon the “feminist” term in the title but of course retained content that clearly acknowledges the roots of the process in women’s ways of being in the world, and feminist traditions based on women’s traditions. The fact is, however, that many groups of women and men have long and strong connections to processes that can be identified as “participatory democracy” (native cultures that have strong verbal traditions, and Quaker traditions for example). But by and large, these ideals have not been translated into large public arenas – until now!! The video is about 8 minutes long … but well worth taking the time to watch, and to also reflect on the significance of what is going on all around us! This entry was posted in Books, Feminism, Making change, Occupy Wall Street, Peace & Power, Politics, Social Issues and tagged 99%, group process, Occupy, participatory democracy, Peace & Power, shared leadership. Bookmark the permalink. What a moving and informative video! It’s quite encouraging to see such young leaders who are willing to envision a different kind of world! And are putting their time, energy and devotion into creating it. Peggy Chinn Blog by Peggy Chinn is licensed under a Creative Commons Attribution-NonCommercial-NoDerivs 3.0 Unported License.